The Arab awakening is turning into the Arab nightmare. Instead of ushering in democracy, the uprisings in at least three Arab states are fast becoming vicious civil wars. In the past 10 days, crucial developments in Syria, Libya and Yemen have set these countries spiralling into violent and intractable struggles for power. 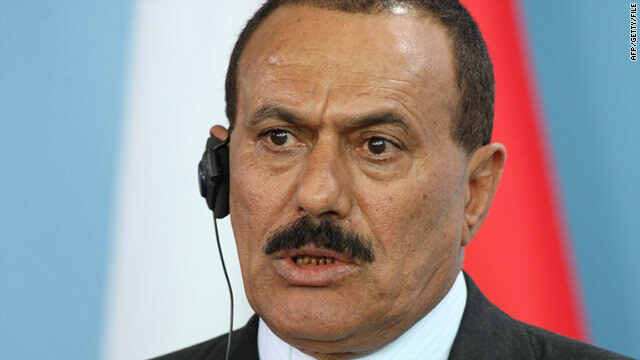 Yemeni President Ali Abdullah Saleh (pictured in 2008) was injured Friday from an attack at his presidential compound. (CNN) — Tribal fighters took control of a top Yemeni city on Tuesday, a setback for an embattled government whose injured president is confined to a hospital in Saudi Arabia. More than 400 tribal gunmen took over Taiz in southwest Yemen, eyewitnesses there said. The gunmen had been clashing with Yemeni security forces near the city’s Republican Palace and eyewitnesses said they are now in control of the city. The palace is not far from the city’s Freedom Square — a focal point of anti-government protests. Who will lead Yemen now? Yemen‘s main political opposition accepted a transfer of power to the country’s vice president after President Ali Abdullah Saleh traveled to Saudi Arabia for medical treatment following an attack on his compound Friday. But it’s unclear who will replace President Saleh more permanently if he doesn’t return, and whether Vice President Abdul Rabu Mansoor Hadi will be accepted by the other groups vying for Saleh’s ouster. Saleh was injured Friday when opposition tribesmen shelled the presidential compound, targeting a mosque during Friday prayers. Saleh’s forces and Yemeni tribesmen, who have engaged in pitched battles for nearly two weeks in the capital, continued fighting this weekend, the Washington Post reports, despite a truce brokered by Saudi Arabia. Four of his guards were killed and the speaker of the parliament was in a critical condition after shells hit a mosque in the compound. The prime minister was also reportedly injured in the attacks as street fighting between President Saleh’s forces and a tribal federation widened on Friday in the capital Sana’a. Opposition television claimed President Saleh was killed after the attack but the reports appeared to be false. A Yemeni party official later said President Saleh was “fine”, and will hold a news conference later today. Antigovernment protesters react as they block the road with rocks and burning tires during clashes with Yemeni security forces in Taiz, Yemen, on Wednesday, June 1. After months of trying to tamp down unrest, Yemen‘s embattled President Ali Abdullah Saleh and his security forces have become embroiled in a conflict that meets all the classic definitions of a civil war. He and his security forces are now fighting on three main fronts: In the capital of Sanaa, Saleh loyalists are engaged in a pitched battle with tribesmen under the direction of Sheikh Sadiq al-Ahmar, leader of the powerful Hashid tribal confederation; Islamist militants have taken control of the southern province of Abyan; and in the southern city of Taiz, Saleh’s Republican Guard violently dispersed protesters. Yemeni government forces have reportedly killed more than 50 people since Sunday. 27 May 2011 – The United Nations human rights office today voiced alarm at the escalating violence in Yemen, which it said may push the country to the brink of civil war, and called on the Government to stop its deadly crackdown. The Office of the UN High Commissioner for Human Rights (OHCHR) said it is trying to confirm reports it has received of dozens of civilian casualties, including women and children, in the fighting over the past few days, as well as reports of shelling by Government troops in residential areas. The death toll has reportedly approached 100 since fighting began Monday after Yemen’s President, Ali Abdullah Saleh, refused for a third time to sign a deal to transfer power amid the pro-democracy protests that began earlier this year. Thousands of anti-government protesters are standing their ground in the capital of Yemen, despite a deal that would see the president step down. Protesters occupying a permanent camp in Sanaa say they don’t trust President Ali Abdullah Saleh to keep his promise to leave office. Mr Saleh agreed on Saturday to hand over power to his deputy within 30 days in exchange for immunity from prosecution. Protesters say he must go immediately. There were fresh demonstrations in Sanaa and in other parts of the country on Sunday. Witnesses say the protesters in Sanaa are ringed by army units that defected to join and protect them. Uniformed soldiers were seen chanting alongside the demonstrators and flashing victory signs. At least 130 people have died during two months of protests inspired by uprisings elsewhere in the Arab world.